New York Jetsi peatreener Rex Ryan (vasakul) ja Margus Hunt. NFL coaches at pains to figure out Margus Hunt worth. New York Jets head coach flies to Dallas to train with the Estonian. Margus Hunt has become the curiosity of NFL for the simple reason of even experts failing to determine his real worth. Mr Hunt might be a future Hall of Fame guy. Or, he might be a loser. To get a measure of clarity, for instance, the New York Jets head coach Rex Ryan flew to Dallas, in person, to train with the Estonian. A defence specialist, he actually – physically – tried colliding with our guy. News agency CNN came out with a lengthy Mr Hunt story headlined «NFL teams feverish to solve the Hunt mystery». The mystery being that with his bulk – 2.03 metres of height, 125 kg of weight and hands stretched to 2.10 metres – and sheer power, Mr Hunt happens to be the toughest dude of the draft. Excepting the breakers i.e. running backs with extraordinary physiques, Mr Hunt got the rest of the bunch’s best total results at recent NFL physicals. However, it’s not clear how Mr Hunt, with his less-than-four-years football career, will be able to use all his might in a game. And anyway, is the familiar defensive end (DE) position the best for him, ask US specialists. Maybe he ought to be placed outside linebacker (OLB) or even taken to attack, to be tight end? By the way, when training with Mr Hunt, Mr Ryan also tried him out as OLB. 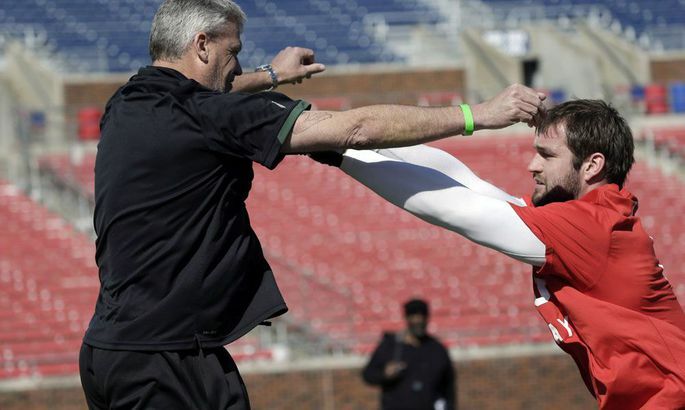 Jets’ head coach visiting Dallas, where Mr Hunt was presenting himself to talent hunters among other footballers recently graduated from Southern Methodist University, at the so-called pros’ day, came as total surprise. Mr Ryan just marched up, tackled Mr Hunt and gave him an all out individual training. Thus, Jets is interested, as Mr Hunt says that head coaches do not travel that far just for fun. Philadelphia Eagles and Tampa Bay Buccaneers also show signs of eager interest, Mr Hunt having met the coaches. On their home courts, though. The closer to the draft, the clearer it becomes that Mr Hunt will be picked in round one. As a good sign, a leading specialist Bucky Brooks raised him, at official NFL website, by ten notches to 30th among juniors. Expert Mike Mayock placed Mr Hunt second among 3-4 formation defensive ends.